If you are a bit stuck for gift ideas this Christmas, or have a rather large family to buy for, why not purchase a board game? They are fun for all ages and much cheaper and easier than getting individual pressies! 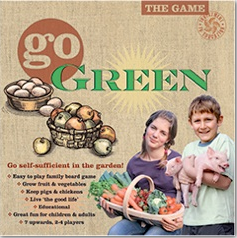 Go Green Board Game www.gogreenboardgame.co.uk is a new, fun and educational board game, designed to allow you to become self-sufficient and green – if only for a few hours! The box contains miniature pigs, chickens and hay bales to fill your garden with. You can also grow fruit and veg in your allotment. It has been raved about by many, and now here at Inspired Times, we are joining in on the fun! As you work your way around the board with a wheelbarrow, all of these items can be collected and added to your (hopefully!) thriving patch of land. Along the way you get to learn some amazing facts about sustainability through ‘Natural Selection’ multiple-choice cards. If you get the answer right, you win a hay-bale to feed your livestock. If not, you still learn eco-information about some rather amazing facts, such as the UK imports 90% of all its fruit! 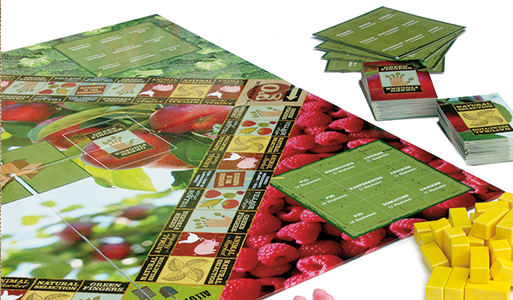 To add risk to the fun, ‘Green Fingers’ cards throw obstacles in your path of going green. Foxes may eat your chickens, or your own animals may eat your vegetables! You never know which way it will go in this engaging and innovative game. The winner is the person who grows the most fruit and veg in their allotments and who owns the most animals in their gardens the first! Play to your hearts content with kids and adults alike. If it’s good enough for Hugh Fearnley-Whittingstall, it’s good enough for us! Starrs Farmhouse, in the quaint village of Little Sampford in North Essex, is the place to retreat from our hectic, modern-day lifestyles. A Nature Nurture Workshop allows you the time and space to refuel your spirit and to engage in your creative talent. Both day and weekend workshops are open for everyone to enjoy. Encompassing Creativity, Cake and Crafts as well as, reflexology and massage treatments, the central focus is Self Development inspired through nature and creativity. Nature Nurture offers some fabulous weekend retreats, but for lucky locals, the Making Mornings are an inspirational treat. Enjoy creating contemporary crafts from old recyclable fabrics, in harmony with a fresh pot of tea and a slice, or two, of homemade cake. The Weekend Workshops create the opportunity to socialise and relax within a natural environment, helping to reduce the stress accumulated in our bodies. Nature Nurture retreats offer the opportunity to pause, listen and reflect, free from any pressures from the outside world. As we humans are an integral part of the natural world, Nature Nurture’s principle is that, by immersing ourselves in nature, true solace can be found. Workshops are running throughout the summer. Starting from £15 per person, including all craft materials, tea and cake, what more could you ask for? This month, Inspired Times Yogini Lila Conway has been donning Asquith’s white drawstring yoga pants. These pants are formed from soft, ethically produced brushed organic cotton jersey, and embellished with a discreet row of Swarovski crystals along the bottom for a subtle touch of elegant bling. Lila says they are the comfiest yoga pants she could’ve imagined, they wash well and have a flattering cut. She wears them not only during lessons but as often as possible! Now you can follow Yogini Lila’s fashion sense. Asquith are offering readers an exclusive 20% discount. For a range of classic, elegant and flattering yoga outfits, and a truly sensational experience in comfort, visit www.asquithlondon.com before May 1st, type INSPIRED20 into the promotional code box when ordering online, and receive your exclusive 20% discount. We just came across this wonderful place online. It is an international residential centre in Slovenia whose aim is to help people reconnect with nature and the natural world. Their retreats, seminars, workshops and conferences are all geared towards enhancing healing and individual transformation on a physical, emotional and spiritual level. The centre is set within 3 acres of natural beauty, and the centre and the land have been harmonized using Living Harmony and Feng Shui principles to promote an atmosphere in which people can regenerate, feel calm, relax, energise and tranform. The centre has been furnished by local craftsmen using natural materials. The workshops run by the centre for spiritual development and self-growth are open to anyone seeking development, harmony and healing. For example, Pierre Pradervand is running ‘The Gentle Art of Blessing’ in April, on the benefits of using blessing as a tool for healing. Carolyn Cowan is running a workshop on Leadership and Liberation for empowering women of the 21st century, enabling them to keep their own identity as women, and let go of the need for anger or blame. Carolyn uses Kundalini Yoga techniques and meditations to challenge perceptions and promote freedom. Participants will leave with personalised plans for growth. Contact Viviane Fingerhut to book at info@livingharmony.co.uk or telephone her on 020 8958 1740. Are you interested in expanding your mind, learning about alternative methods of living, accumulating positive energy through new activities, and meeting like-minded people? Then head to the Mind Body Spirit Festival in Manchester. The Mind Body Spirit Festivals are the largest UK events in their genre. Building on the fantastic past festivals, ongoing since 1977 in London and 1996 in Manchester, 2010’s Manchester Mind Body Spirit is set to be bigger and better than ever. A diverse range of workshops will be on offer, as well as alternative healing practices and a free live stage bursting with continuous activity. Demonstrations of Yoga, Tai Chi, Wild Goose Qi Gong, Whirling Dervishes and the Chinese Dragon dance, and a large variety of inspirational musical performances. Stalls providing plenty to experience, purchase, or learn about, including psychic readings, crystals and healing practices, aura photography, spiritual associations, yoga products, artefacts, vitamins, books, music, clothing, jewellery and more. On Friday, develop a deeper understanding of your mind by walking a Labyrinth, a ritual that has been in existence for many years. Soothe your spirit by experiencing guided meditations, available throughout the weekend. And many more! So whether you’re a Mind Body Spirit veteran, in attendance every year since the 70s, or an interested novice seeking new experiences, you’re sure to find something to inspire and fascinate you at this year’s Manchester event. Concessions for senior citizens and unemployed with ID. Accompanied children under 15 are free.